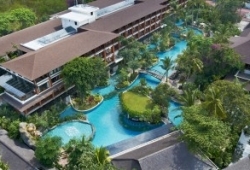 Padma Resort Legian is a 432 rooms five-star resort in the heart of Legian, in 2010 178 newly renovated guest rooms together were unvieled with a brand new Lagoon Pool and the Barong Lagoon Pool Bar & Café. The resort’s multi-million dollar facelift was inspired by its desire to offer an idyllic retreat for each of its guests. 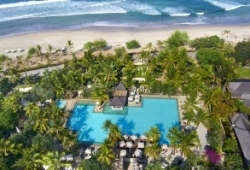 Amid the hustle and bustle of Legian area, a popular tourist destination in Bali, just between Kuta and Seminyak. The 104-metre lagoon pool, including a grotto that comes with a waterfall, recreates the ambience of an exotic oasis with a visually inspiring landscape of native greenery and encompassed by a generous sundeck fashioned out of reclaimed timber that gives the setting a timeless appeal. Small islands within the lagoon feature carved stone statues depicting Bali’s legendary barong and other mythical creatures. The pool is situated in front of a four-story building, which houses the recently refurbished room types – Deluxe Rooms, Deluxe Lagoon View, Lagoon Access Rooms, Premier Rooms, and Balcony Suites. In early 2015, Padma Resort Legian proudly announced its newly launched Family Block as one of the resort’s commitments to enhance the stay experience of our family guests. Widely known as family hotel and recognized by TripAdvisor as number one hotel for family in Indonesia and top 25 in the world in 2014. Padma Resort Legian also introducing the new Beach Club that located right at the beachfront of Legian Beach, which famous for its sunset. Officially launched in February 2015, S.K.A.I. Beach Club at Padma Resort Legian is set to take the relaxing art of sun-downing to exciting new heights. S.K.A.I. which stands for Sunset•Kocktail•Alfresco•Indulgence is a masterpiece of captivating ambiance, exquisite designer’s cocktails, island-elegant design and delish cuisines. The Deluxe Room takes contemporary Balinese design to a new level of existence with a tasteful décor that explores the island’s creative heritage. A private balcony completes this well-appointed room category. Room size 38 sqm. King size bed or 2 x single beds. With a stunning view of 104 metre lagoon styled swimming pool from the private balcony, the Deluxe-Lagoon View Room takes contemporary Balinese design to a new level. The plush and sumptuous linens ensure a quality sleeping after indulging in the egg-shaped tub or separate rain shower. Room size 38 sqm. King size bed or 2 x single beds. The Deluxe Chalet is a charming room category that is designed for comfort as well as privacy. Each room has its own private balcony to sit and appreciate the gentle whisper of the evening sea breeze. Room size 43.8 sqm. King size bed or 2 x single beds. Features a private terrace with a tropical garden view. The luxury bathroom comes with a separate shower and egg-shaped tub for spa-styled bathing indulgence. Some of the rooms come with oversized twin beds (Premier Twin Room). These rooms are designed to anticipate the needs of guests traveling with children. Room size 44.3 sqm. King size bed or 2 x single beds. The 64.4 sqm appointed family room are facilitated with one master bedroom, one child room with bunk-beds, two bathrooms and private balcony. The building is assembled elegantly with access to the large swimming pool with three slides and enticing lush gardens. The privilege of direct terrace access to the crystal clear waters of a tropical lagoon is an exclusive feature of this new room category. The en-suite bathroom with its egg-shaped tub and separate shower recess is the ultimate in personal indulgence. 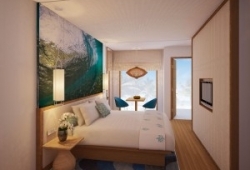 The Lagoon Access Room is all about living for the moment – Bali style. Room size 42 sqm. King size bed or 2 x single beds. An intimate haven for honeymooners, the Premier Club Chalet is all about sharing quality time with a loved one. It features a luxurious bathroom with his & her vanities, a separate rain shower and generous bathtub for romantic moments together. Garden Club Lounge special benefits apply to guests staying in this room category. Room size 52-59 sqm. King size bed. This elegant and spacious suite combines the beauty of Balinese interior design and a stylish décor. Facilitated with a comfortable living room and flawlessly designed terrace where you can indulge in a little piece of paradise. Room size 85 sqm. King size bed. This modern suite embraces the healthy attributes of a tropical lifestyle with an extended open-air balcony to relax in the sun. A separate living room is infused with natural daylight and can accommodate another guest in complete comfort without compromising privacy. Room size 85 sqm. King size bed. Two bedroom Balcony Suite is specially designed for those who love indulgence. With comfortable living area overlooking the outdoor greenery in the main room, this room type is ideal for families looking to spend some quality time. The connecting room has separate egg-shaped bath and shower area. Room size 142 sqm. King size bed or 2 x single beds. The Deluxe Suite is a sophisticated retreat for travellers who enjoy the finer pleasure that life has to offer. This contemporary open-plan environment seamlessly integrates sleeping and living quarters yet creates a distinct feeling of privacy through strategically placed furnishings. It also features a dining area and kitchen alcove for personal use. An airy balcony with a cosy daybed offers refreshing views of tropical greenery. Room size 106 sqm. King size bed. This exclusive three-bedroom villa, complete with tastefully appointed living room, bar and service kitchen, is resplendent of a tropical residence. The suite’s landscaped garden with its inspiring ocean views is the perfect venue to host a wedding ceremony or social gathering for up to 100 guests. The Presidential Suite is secluded from mainstream resort activity and has its own private swimming pool. It entitles discerning travelers to 24-hour butler. Room size 338 sqm. 2 x king size bed or 2 x single beds.